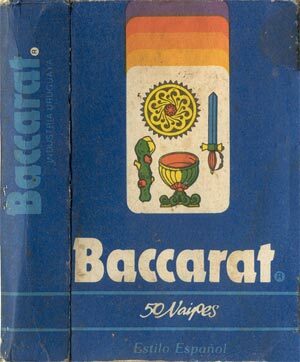 Above: naipes ‘Baccarat’ published by Akosol S.A., Paysandú 1382, Montevideo, Uruguay, printed by Ingrapa, c.1980s. 48 cards + 2 Jokers in box. The Ace of Coins features a crowned female bust inside a wreath above two cornucopias all resting on a plinth, with flags draped behind. 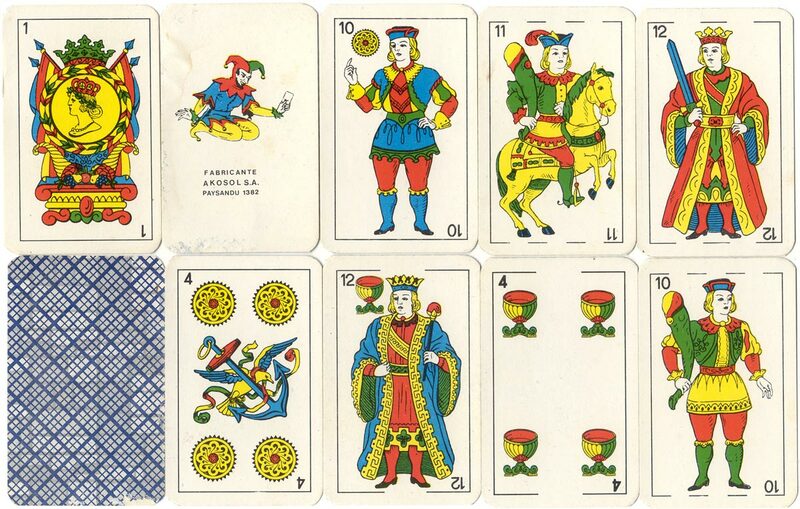 The design of the cards is the typical version of the Spanish Catalan pattern which is used in South American countries, especially Argentina and Uruguay. For example, see Naipes 'El Gaucho' by Caraven S.A. and 'Naipe Casino' by Justo Rodero, which appears to be the inspiration for the Joker design.